California Three Strikes Law | The Law Offices of Shawn M. George, Esq. If you have been charged with a crime and have a previous criminal conviction on your record (one strike)—even if it was years ago, even if the crime was non-violent—you could be facing a doubling of your prison sentence if you’re convicted again. If you have two “strikes” against you (two prior convictions), you could be looking at life in prison for your current crime. 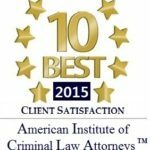 If you have any previous convictions, it’s vital to get the best criminal defense attorney you can. You need a lawyer who will thoroughly investigate your case and aggressively defend your rights. You need Shawn George. With credentials that few law firms can match, Shawn George is a former Deputy District Attorney with extensive trial experience and training. The three strike system can be extremely unfair. We’ve had clients whose prior conviction was ten years ago – they got picked up for a drug offense and are now looking at major prison time! If you have a prior conviction, our goal is to get that prior conviction reduced or dismissed. If you’ve been charged with any of these crimes, call us at 916-605-6212. We work with a licensed private investigator to get the facts in your case. A thorough review of your case can make the difference and pay off in successful results. With a much criminal law experience in the courtroom we understand the kind of aggressive criminal defense you need to avoid a life sentence. If you are facing criminal charges, don’t talk to the police first. Talk to us.